PART III – What is really going on with this Weather? So? So just what changed this past week that took Eagle County, Colorado from weeks of Hot Dry weather to suddenly – rain for the past several days? 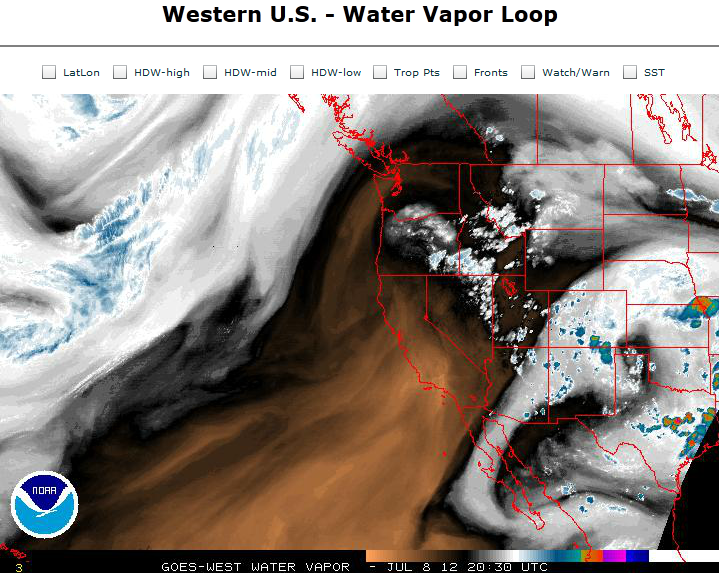 The answer is – you have to look at the big picture and the ECT folks (always concerned with the big picture) went to our friends at NOAA and their GOES West Satellite photos of Water Vapor. The really Cool “picture” comes from watching above as a short (yet, 6 hour duration full motion video) of the water vapor moving. (Click Here) You’ll be glad you did. The rain/moisture Eagle County is getting now is obviously moving in from the South. If you watch the Video (web link above) in the afternoon you can actually see the Big and Smaller Thunderstorms form as they move across the continent. 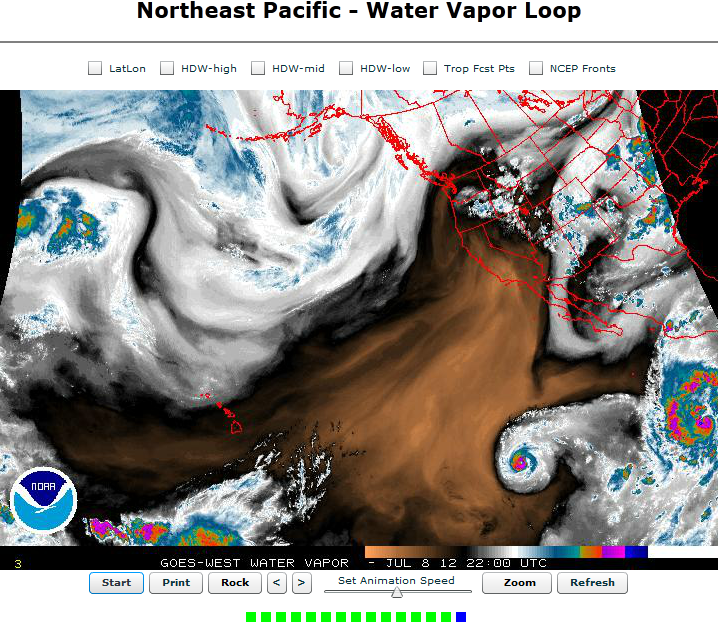 The big orange/fire colored region of the Pacific Ocean has been that way (high pressure system) for WEEKS! It just parked there for the time being, obviously warming the Ocean at that point. It would be interesting to know what the Pacific Ocean currents are doing with warming water in the Pacific this summer. If you’d also like to see what is happening in the Pacific – check this out – (Click Here) By the time most of you read this “Tropical Storm Emilia” will no doubt grow to become “Hurricane Emilia” before Monday morning (9JUL2012) Click on the above link and prove it to yourself. Emilia can clearly be seen spinning counter-clockwise off the coast of Mexico below. Surf height………….3 to 5 feet. Very strong currents and dangerous swimming conditions are expected.